‘Fruit above the middle size, somewhat oval, broadest in the middle, narrowed towards the crown, and a little more so towards the stalk, about three inches and a quarter long, and two inches and three quarters in diameter. Eye open, slightly sunk in a rather narrow basin. Stalk one inch and a half long, inserted in a narrow and rather deep cavity. Skin dull greyish green, full of grey dots, covered partly, especially on the sunny side, with a brownish-grey russet. Flesh yellowish white, melting, buttery. Juice plentiful, sugary, rich, high flavoured, with a musky perfume. In perfection in December and January’ [George Lindley – Orchard Guide p.409/1831]. It was raised in Mechlin, Belgium by M. Jean Charles Nélis, and introduced to Britain in 1818. ‘This pear is one of the best in quality. It is a very general favourite, and the more so, perhaps, because it is always ready to enrich the dessert table through the festivities of Christmas.’ Its season can be extended well into winter if kept cool and then brought in to ripen when required. [HP pl.XXXVIII/1878]. 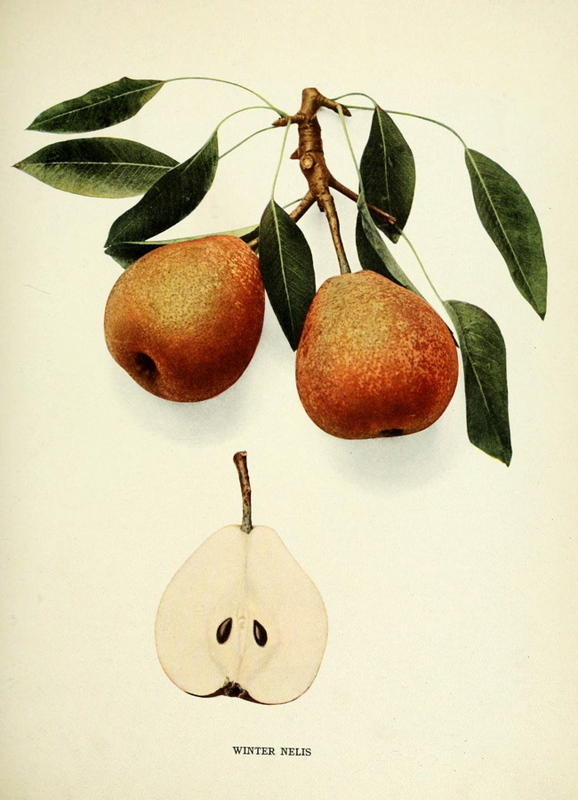 ‘An excellent winter Pear, in perfection in December and January. It was originally raised by M. Nélis, of Mechlin, in honour of whom it has been named; but before its present title was settled, it had acquired, in a few Gardens, the name of Bonne de Malines, which it is but justice to put aside in favour of that here adopted.’ [PM t.126/1830]. Also figured in Pears of New York, p.234/1921, the illustration used here, and in the Pomological Magazine [PM t.126/1830]. ‘Colour yellowish-brown; form obovate; size under medium; quality excellent. In use in May and June.’ [NHM vol.1 p79/1864]. Listed in the 1850 and 1857 catalogues [Pear no.26/1850]. ‘26. April-May. Bears well, fruit small, less juicy than some first rate sorts. In other respects of the highest quality in respect of sweetness and flavour.’ [Diary B, MP A2951/1862].